HTC One has been stealing a considerable amount of lightning from the Galaxy S 4 in mainstream reviews, and now it gears up for another stealer with its recently announced HTC Desire 600 dual sim. This midranger might be the previously reported M4 that'll carry most of the aesthetics of the Taiwanese flagship...maybe not. This 4.5-inch Super LCD2 qHD phone will have a Sense 5.0 on top of the Android 4.1 (Jelly Bean), which means that we're getting a whole BlinkFeed experience that you could customized to flash your favorite sites and social media accounts. Being the Desire 600, you might think that it'll be powered by the Snapdragon 600 but it wont. Actually, it'll have a four-core Snapdragon 200 chipset running in 1.2 GHz instead. Right under the hook are the 1GB of RAM and Adreno 203 graphics processor. This puppy also throws in a BoomSound speakers tweaked with Beats Audio processing. The 8MP "not" ultrapixel camera powers a 720p video recording. Plus, the front camera is a 1.6MP affair with Video Highlights feature (instead of HTC Zoe). Reception-wise, this phone has two SIM card slots. But unlike most of the dual-SIM phone which are dual-standby, Desire 600 SIMs are active at the same time (that means you can get calls on both SIMs). Other connectivity options include (3G) HSDPA, Bluetooth 4.0, WiFi b/g/n and NFC. No pricing has been announced yet. 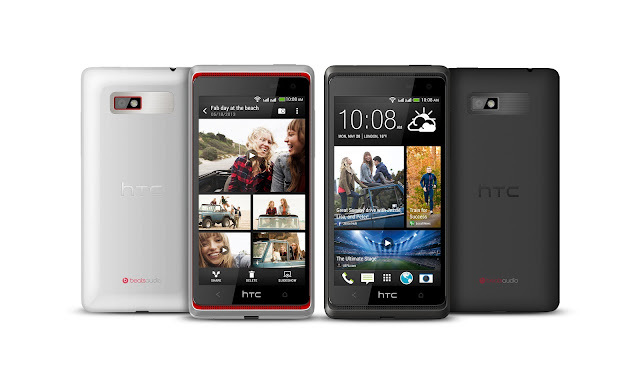 HTC Desire 600 dual sim will come to Russia, Ukraine and Middle East next month. Eventually it'll roll out all over the world including the Philippines.